Body odor affects everyone at some point, but if it is a constant or reoccurring problem, it can be frustrating and embarrassing. Sometimes deodorant, breathable clothing, and a daily shower are not enough to combat strong body odor. Dietary changes are also important to regain a sense of freshness. Fiber is a vital dietary component because it aids digestion. It is also something most Westerners do not have enough of in their diet. Good sources of dietary fiber include whole grains, nuts, seeds, beans, legumes, fruits, and vegetables, especially coconut, raspberries, and artichokes. Studies have shown that red meat consumption can make body odor less attractive. Seafood, which should be eaten at least twice a week, is a good substitute for red meat. Many fish have high magnesium levels and other healthy attributes, while oysters are packed with zinc. Additionally, salmon is great for women going through menopause, as its omega-3 fatty acids can forestall hot flashes, which sometimes contribute to body odor in this stage of life. Beverages that contain caffeine can make people sweat more and give them stronger-smelling sweat. A simple solution is to decrease consumption of such drinks, substituting them for water to hydrate the body. Try drinking juice or flavoring water naturally with orange slices, lemon or lime wedges, strawberries, mint, or cucumber. It is recommended to consume the equivalent of eight glasses of water a day. Vegetable dips are usually healthier than other snacking possibilities, but store-bought salsa and guacamole have excessive amounts of sodium that can cause dehydration just as fast as drinking caffeine. By making these spreads from fresh ingredients at home, cutting out sour body odor becomes more attainable. What's more, avocado contains phytoestrogens, which may help balance out unpleasant smells due to hormonal imbalance during menopause. Sour body odor has been linked to many popular spices, to the despair of foodie sufferers everywhere; garlic, curry, and cinnamon are spices that worsen body odor. This is because they contain components that the body cannot break down and process, so they are released through the pores. However, some seasonings - like mint, citrus, and parsley - all have beneficial effects on body odor. Trying these suggestions today can help make your body odor subside. If dietary and lifestyle changes do not help reduce body odor, it may be time to see your doctor. He or she can help you alleviate your symptoms or diagnose an underlying condition, such as trimethylaminuria (fish odor syndrome). The most common cause of unexplained sour body odor in women is hormone fluctuations. It happens usually during PMS, pregnancy, or the menopause transition. In these cases, natural alternative treatments can be effective. Follow this link for further information on how to deal with changes in body odor and balance hormone levels. 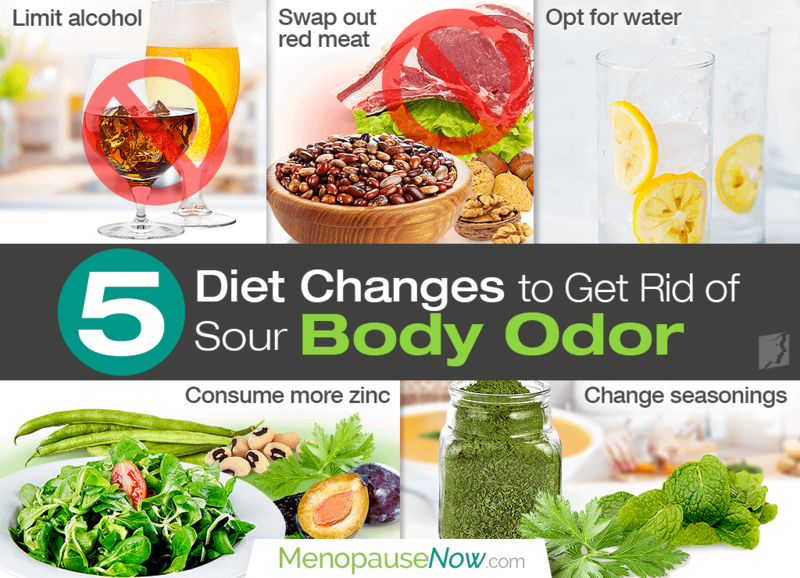 Read on to learn about how to get rid of body odor in six ways to feel confidently fresh in no time throughout the menopausal transition.